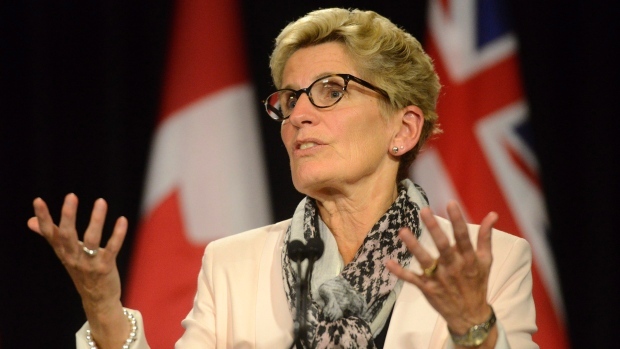 TORONTO - Premier Kathleen Wynne is willing to apologize to Ontario Francophones for a 1912 regulation that prohibited teachers in elementary schools from speaking with students in French. Wynne says it would be "very appropriate" for her to offer an official apology on behalf of the Ontario government to acknowledge that the province's bilingual heritage wasn't always respected in the past. Sudbury Liberal backbencher Glenn Thibeault moved a motion last week asking that the government issue an official apology for Regulation 17, which was enforced for 15 years and finally fell into abeyance by 1944. Thibeault says an official apology would demonstrate that the government recognizes its past errors and is serious about growing the Franco-Ontarian identity and culture. Timmins-James Bay New Democrat Gilles Bisson says his party will vote in favour of the apology because "it doesn't hurt," but he calls it much ado about nothing because the ban on French in schools hasn't been enforced in 70 years. Thibeault says his request for an official apology came from his work with the Francophone community in Sudbury.